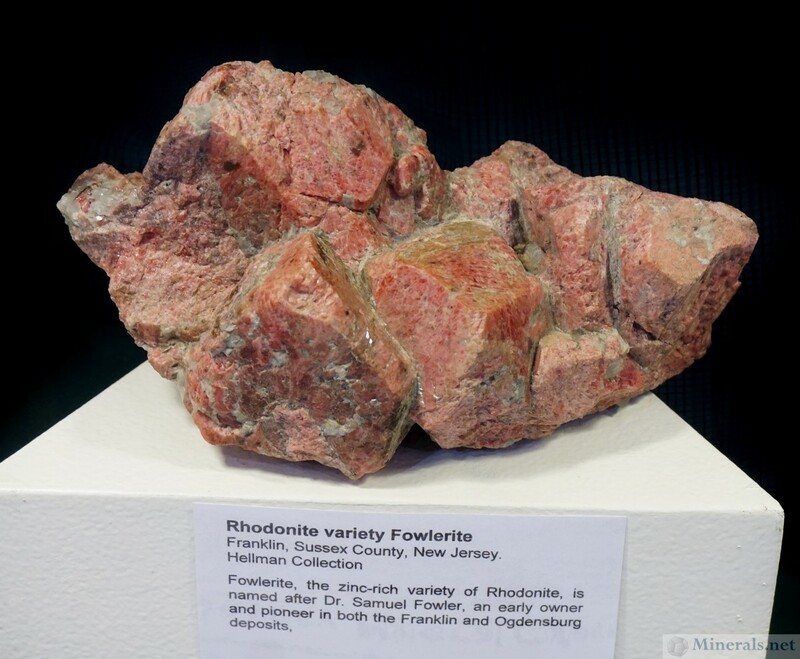 Franklin, New Jersey, hosts two mineral shows every year: one in the spring and one in the fall. This show, along with the Clifton N.J. show, is the best show to get local material and meet local dealers. 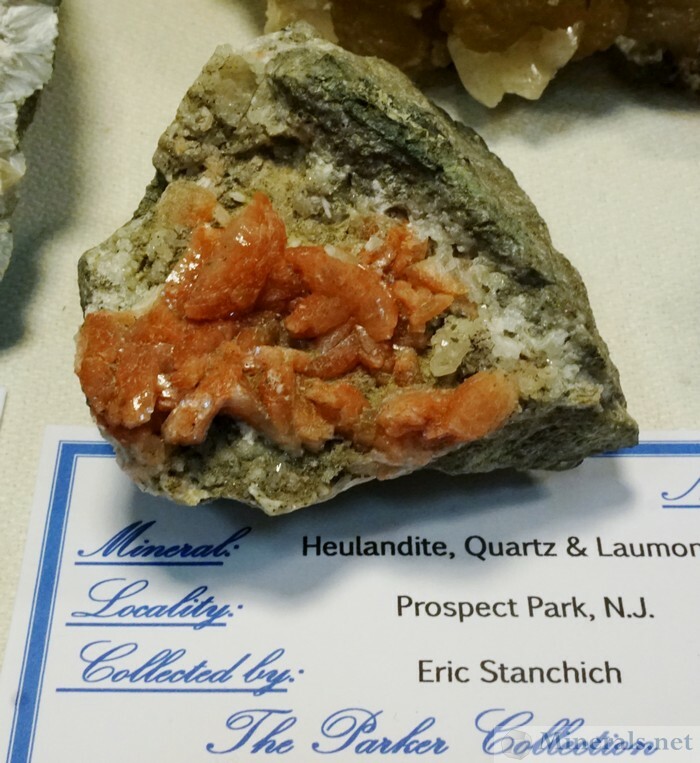 This show also has nice interesting fluorescent minerals to view and buy cases as well as public exhibits put together by local collectors. 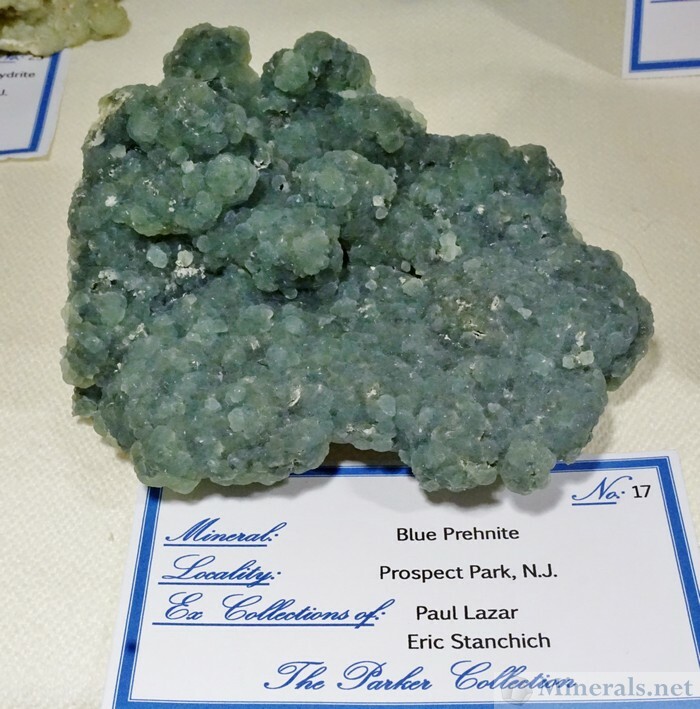 I was somewhat surprised by the lower attendance this year and the amount of dealers not present compared to previous years. As always, though, I was able to find some nice bargains at this show. 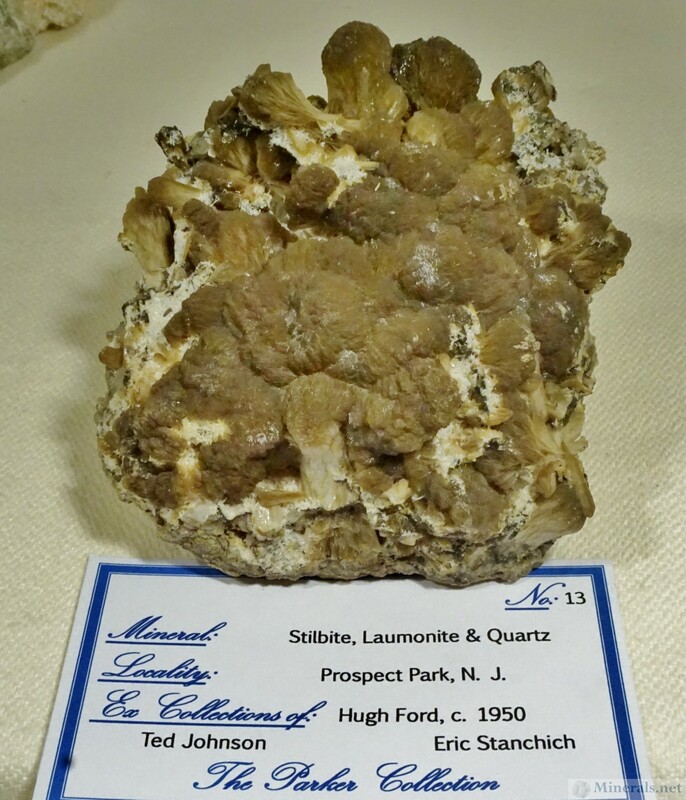 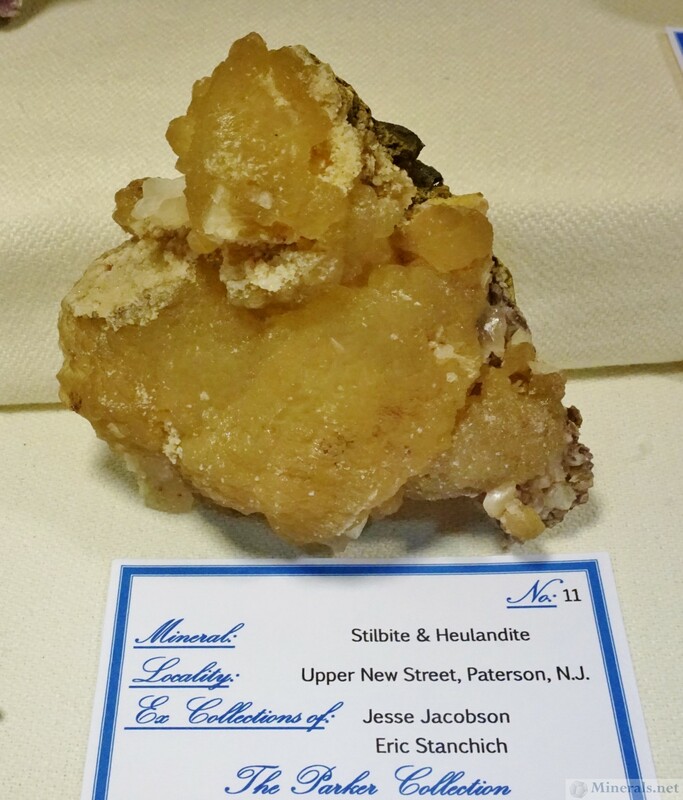 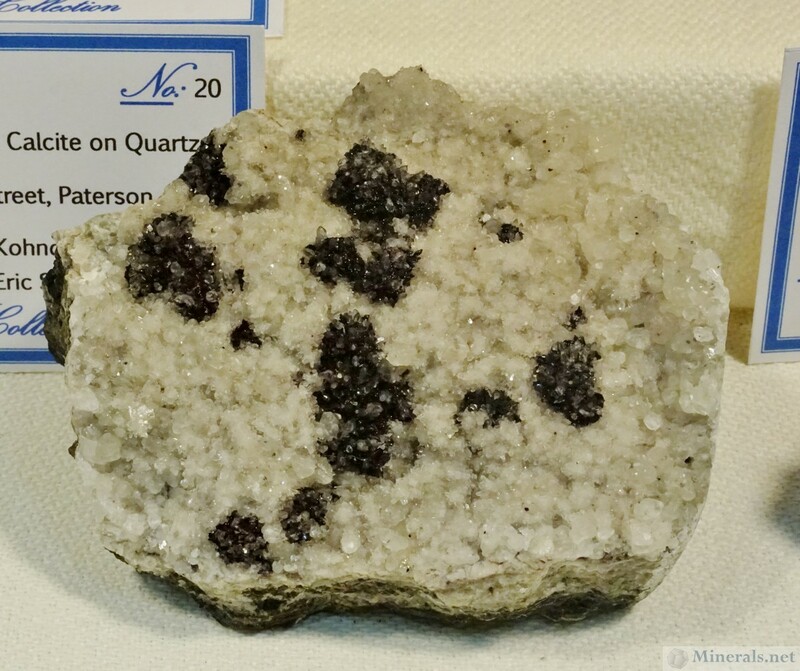 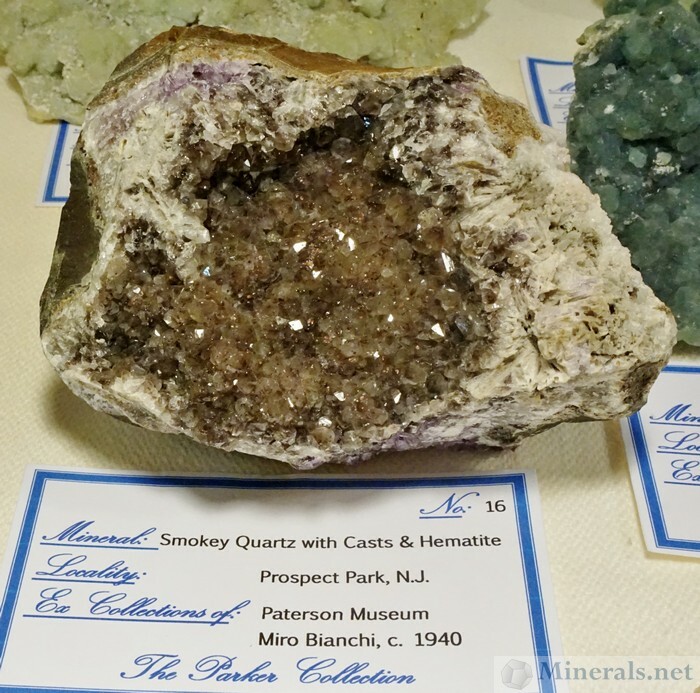 Stan Parker had an outstanding display case of N.J Traprock minerals. Aside from a great selection and great color, he had detailed labels, and had given much thought to the layout of the case. 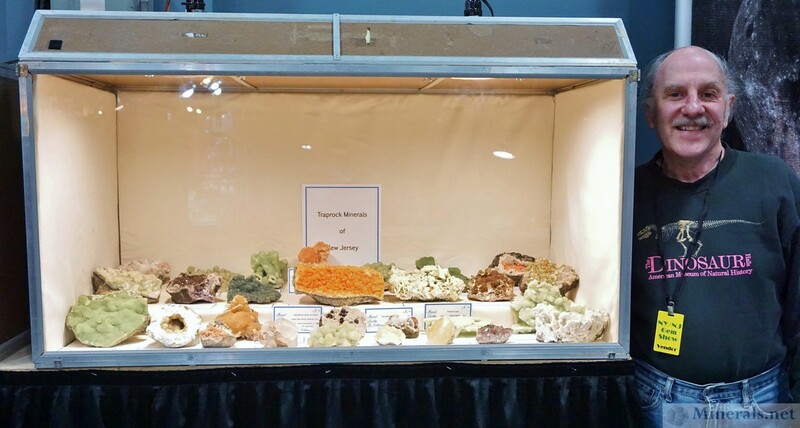 This was by far the best exhibit showcase at the show. 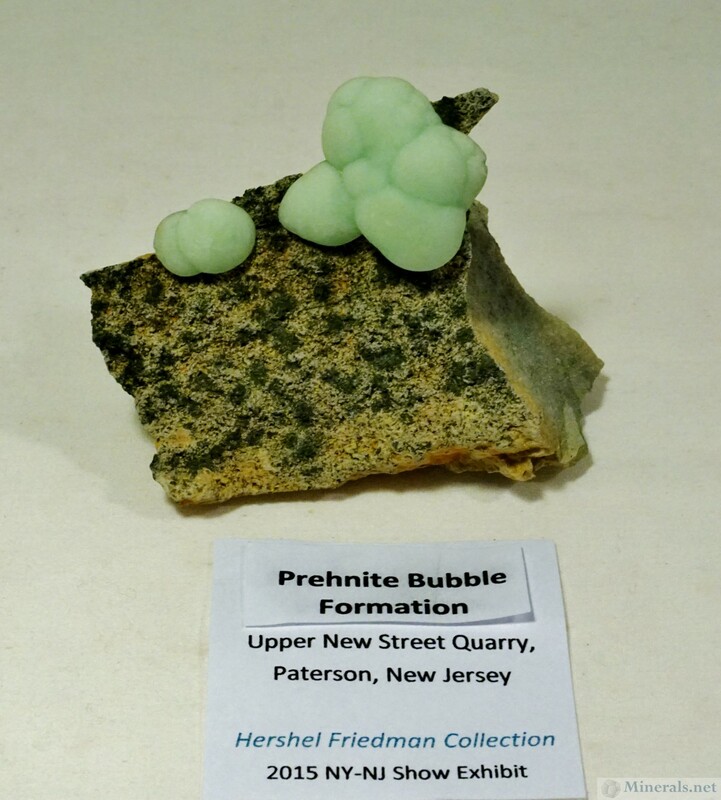 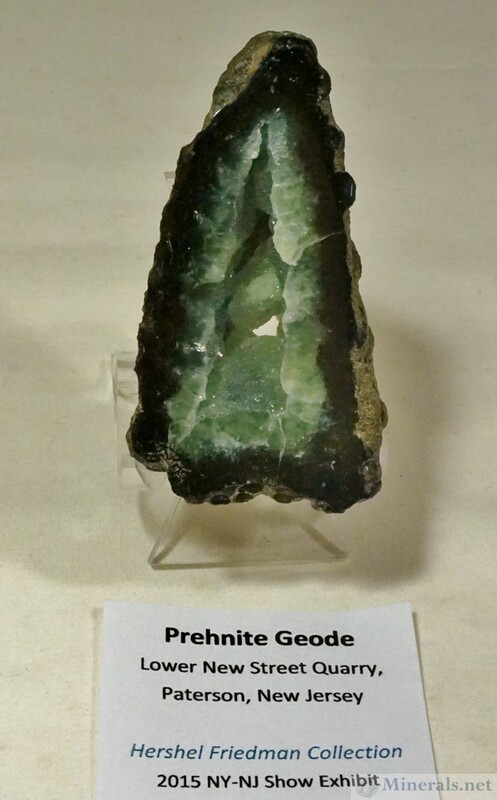 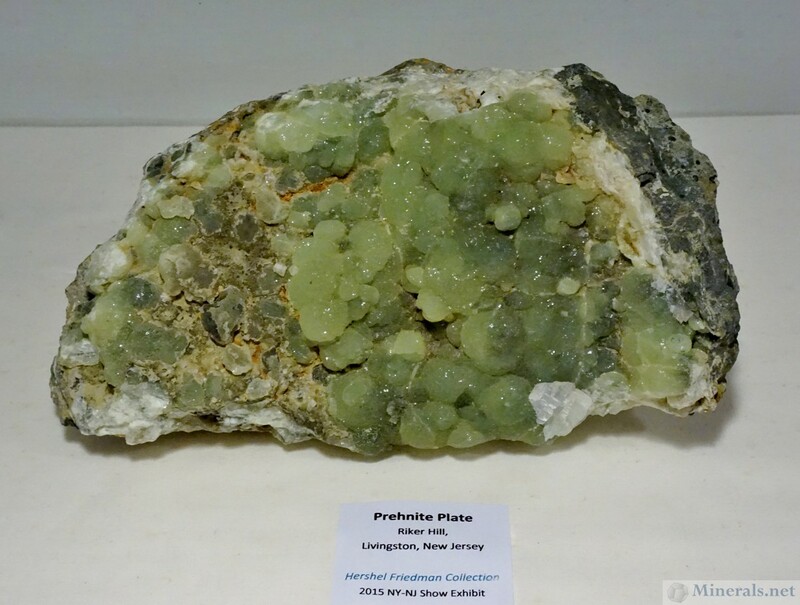 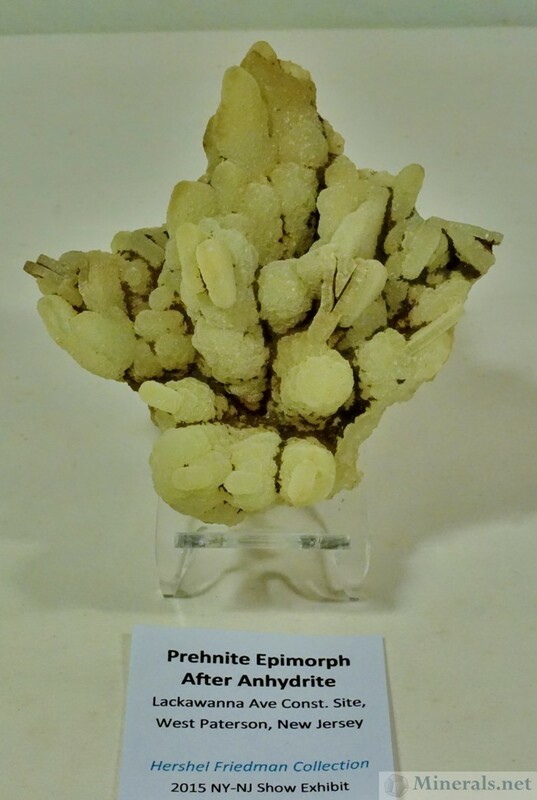 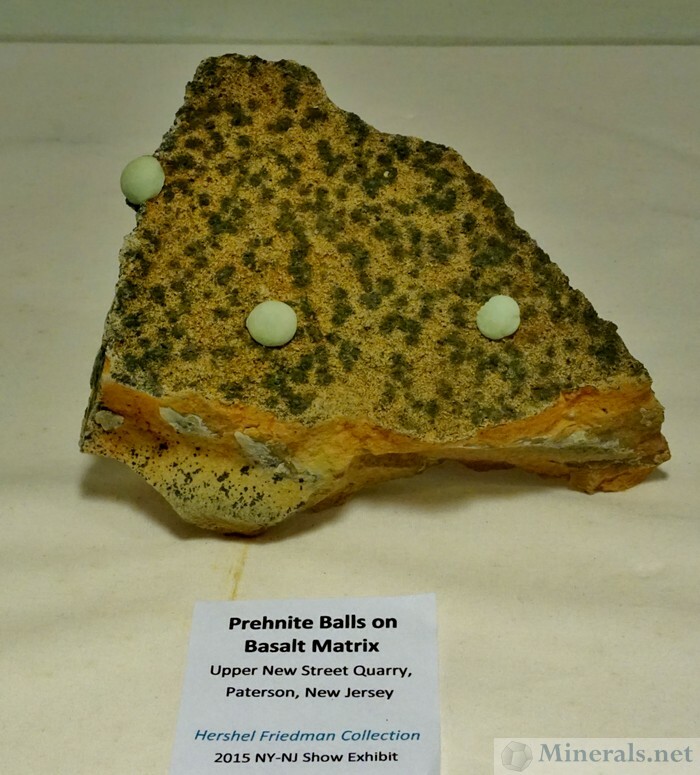 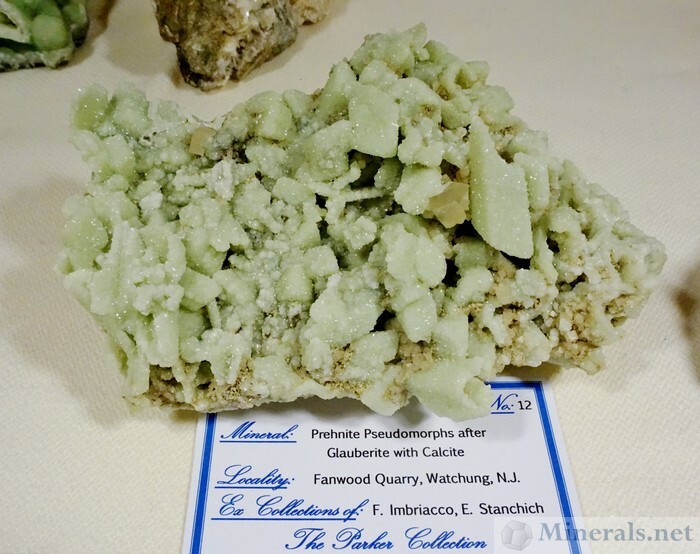 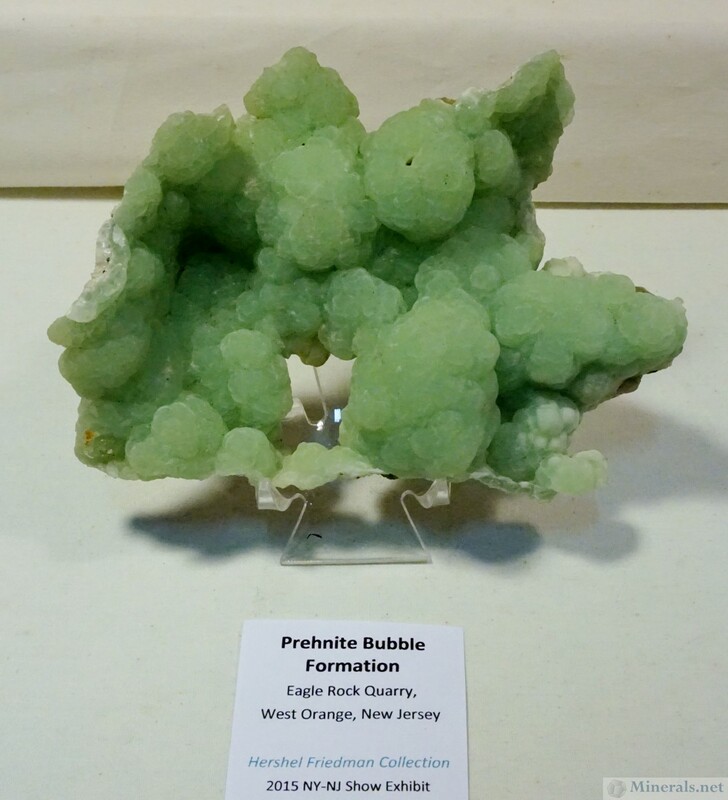 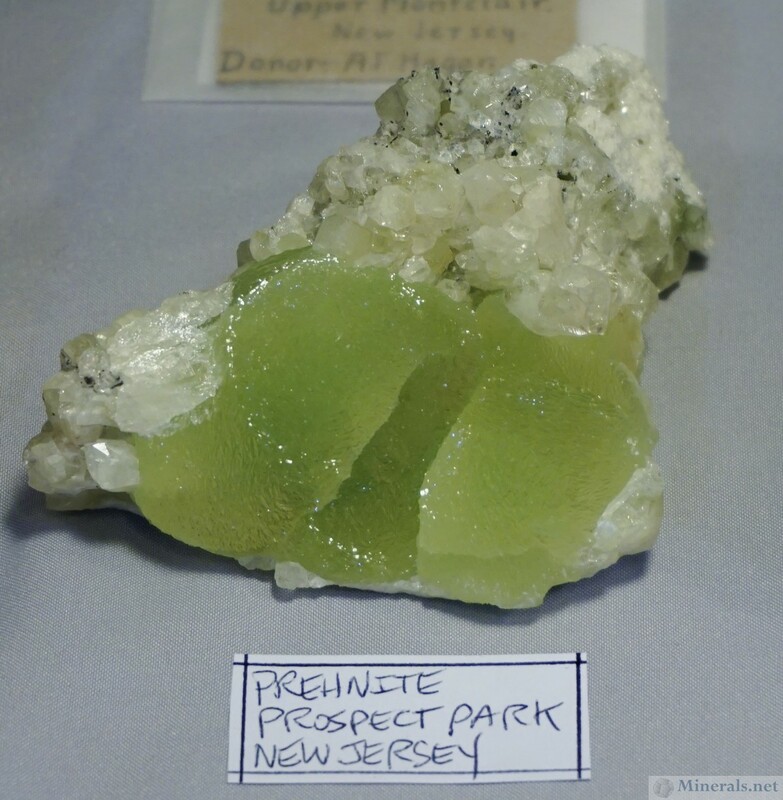 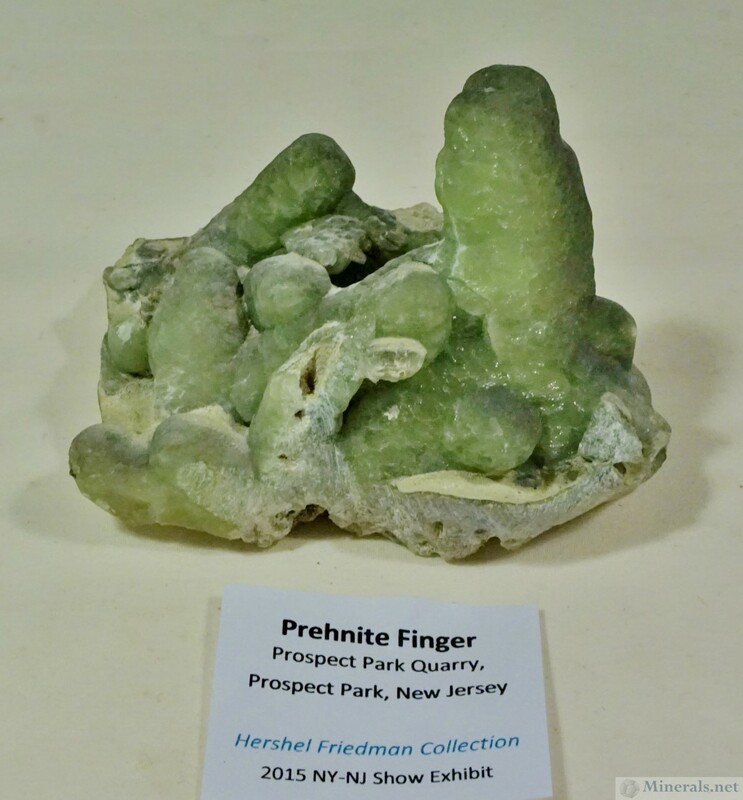 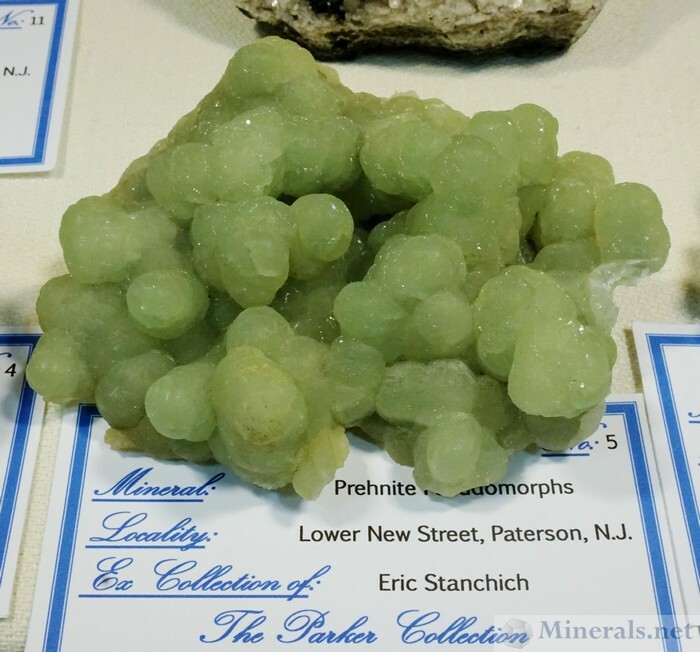 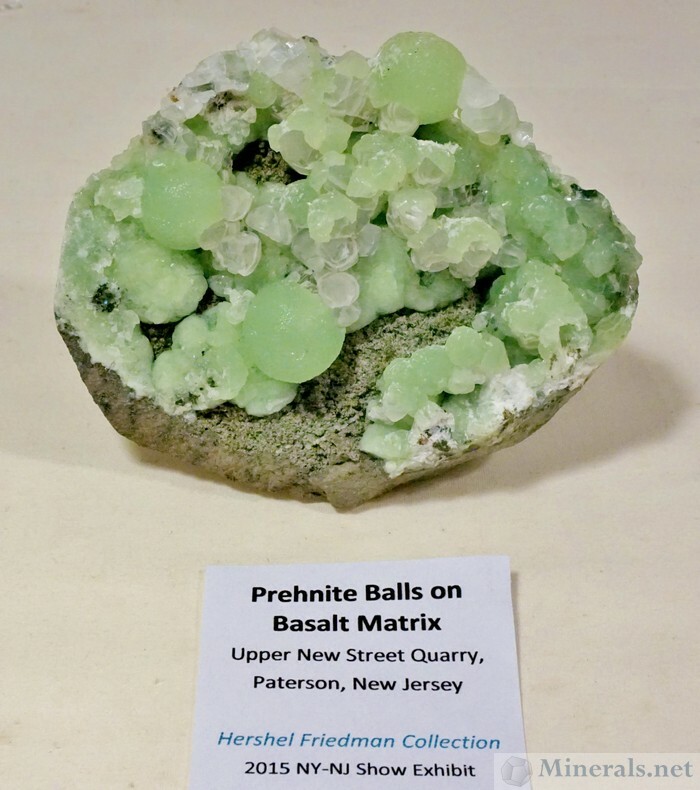 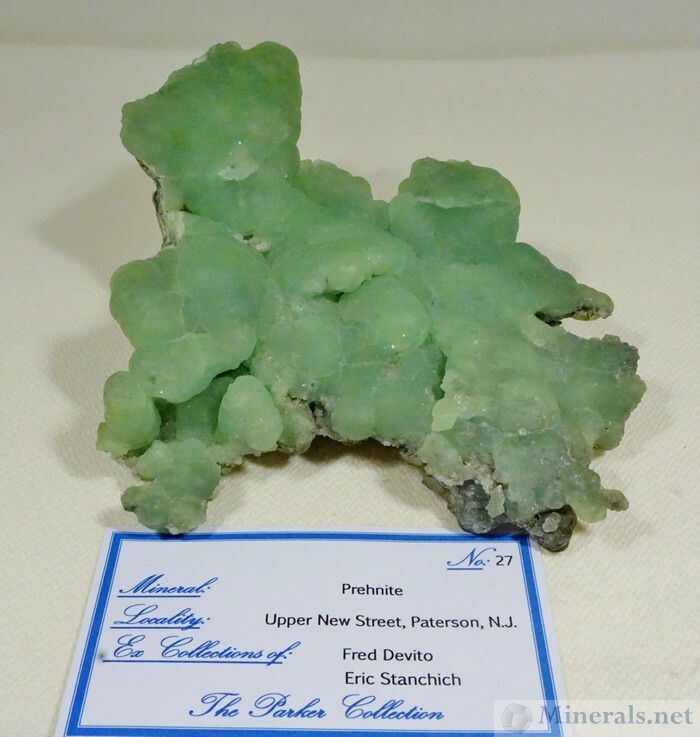 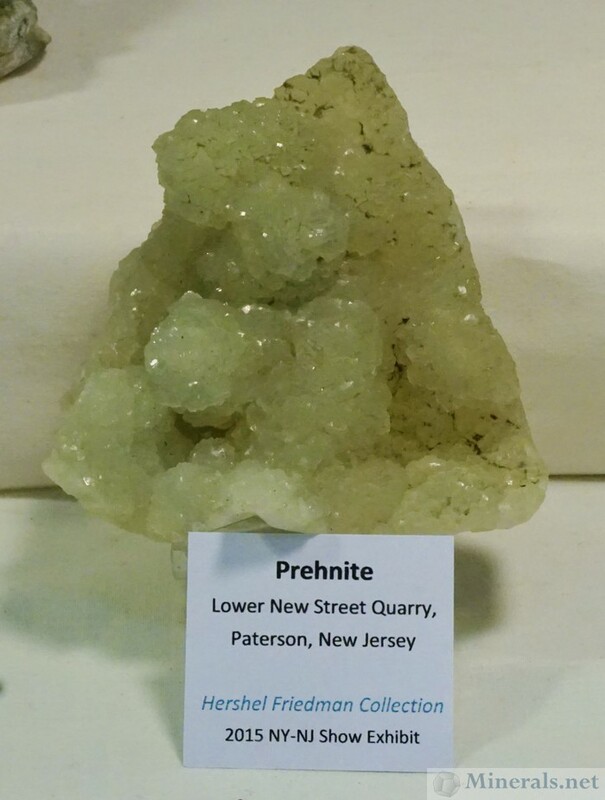 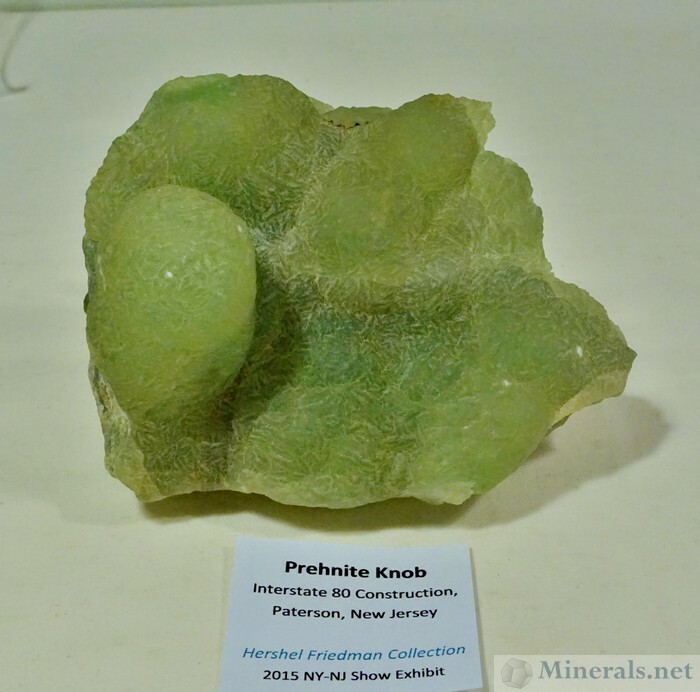 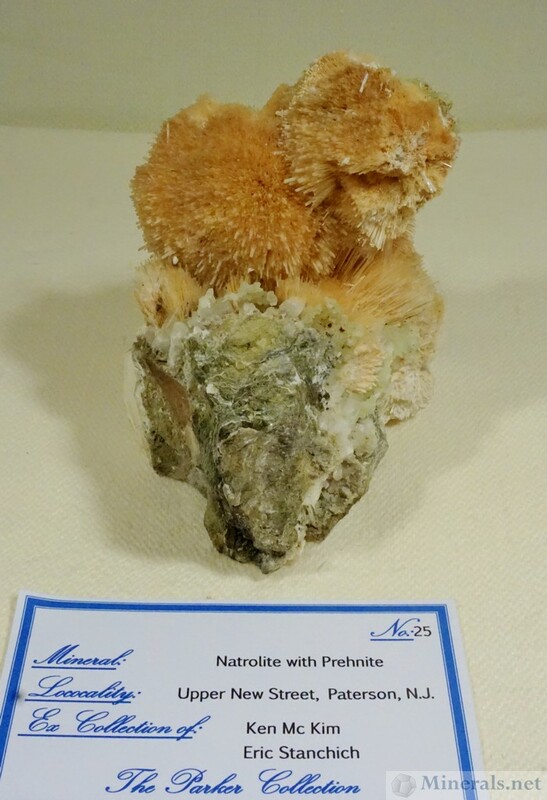 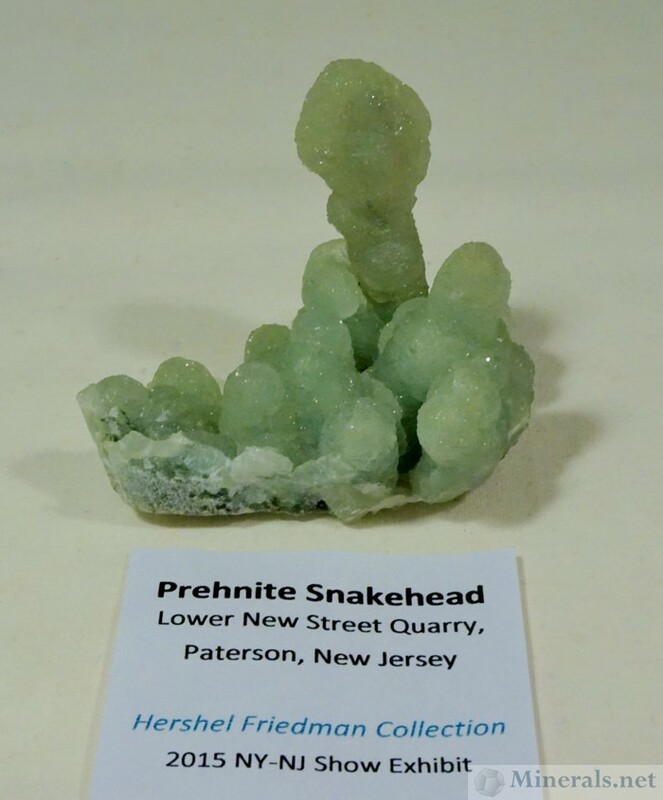 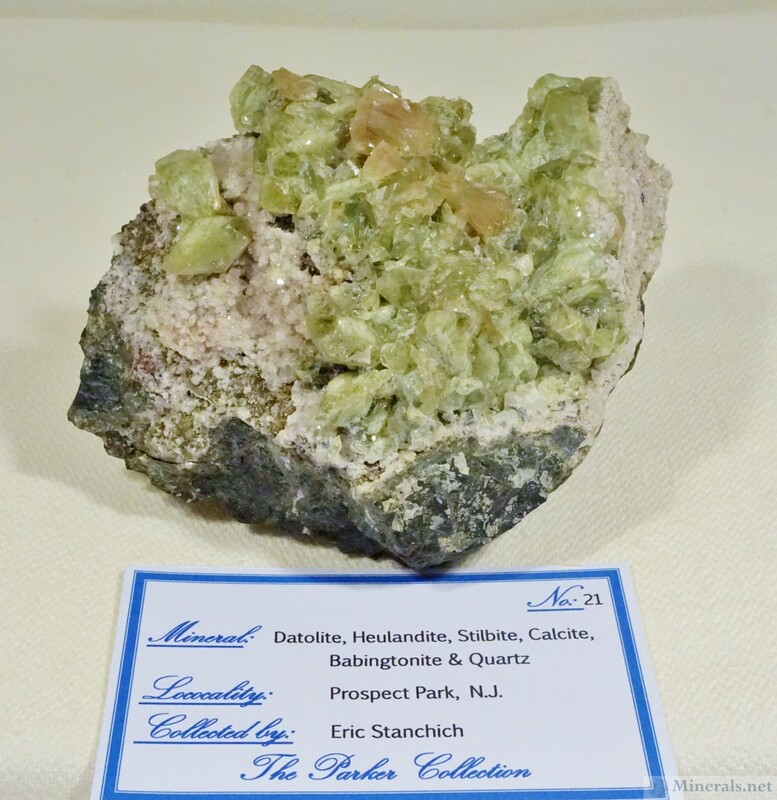 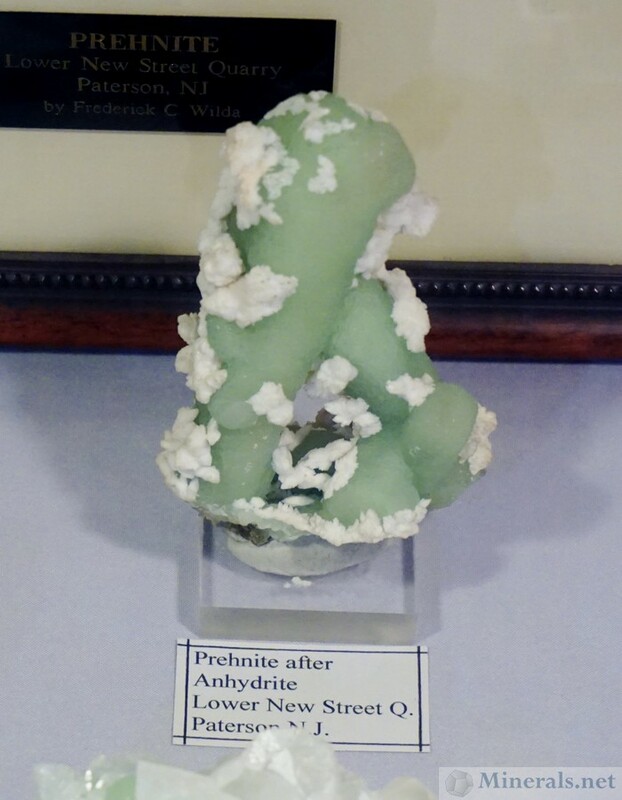 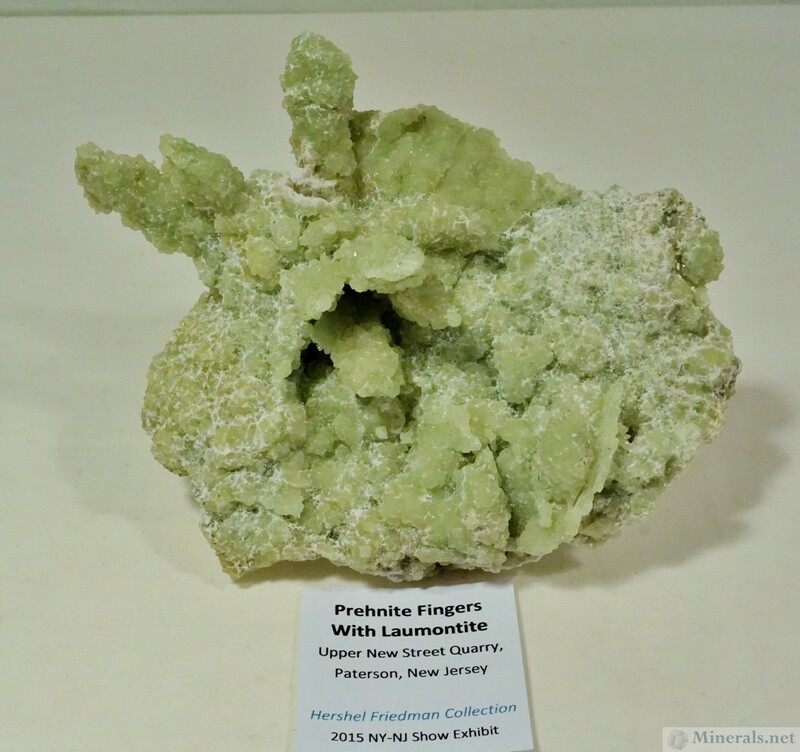 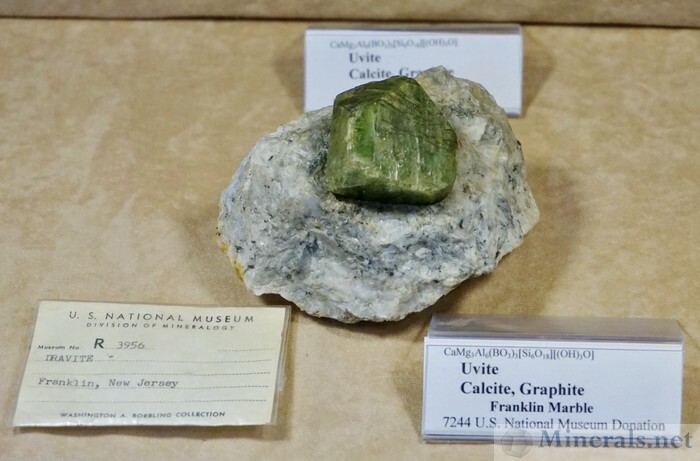 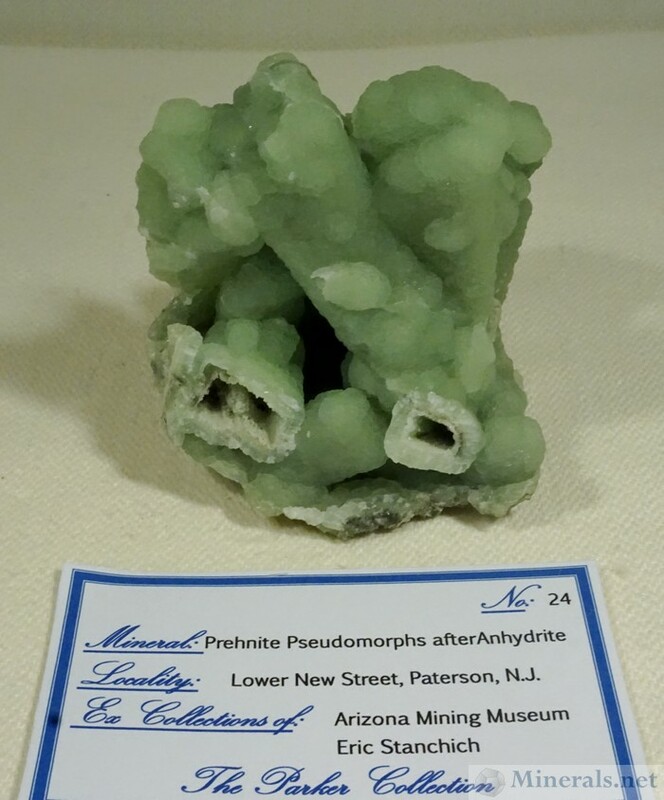 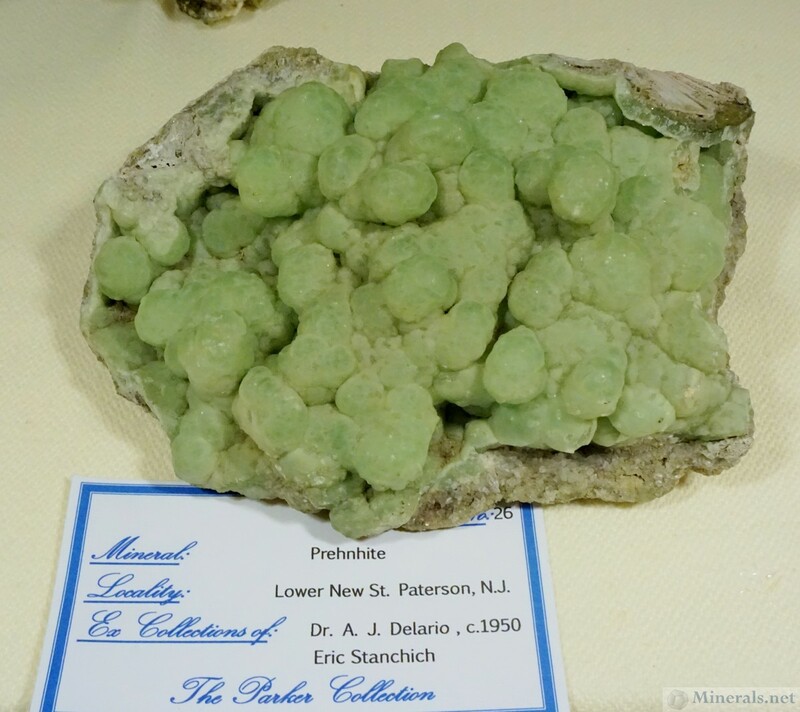 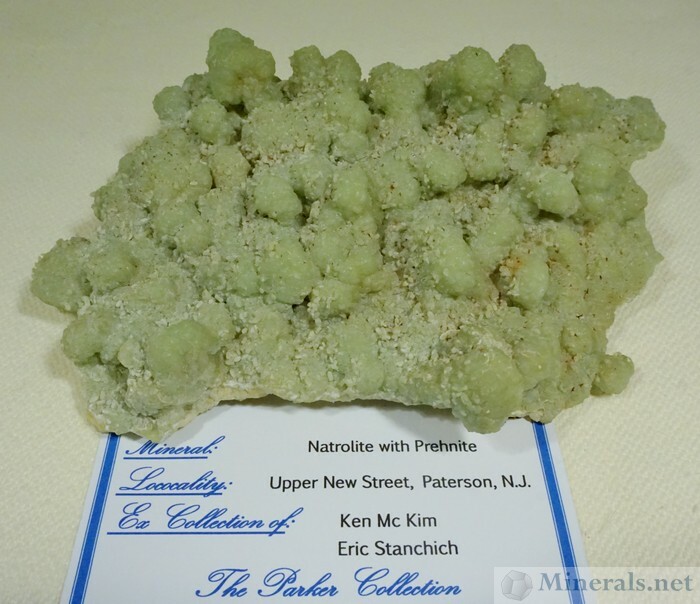 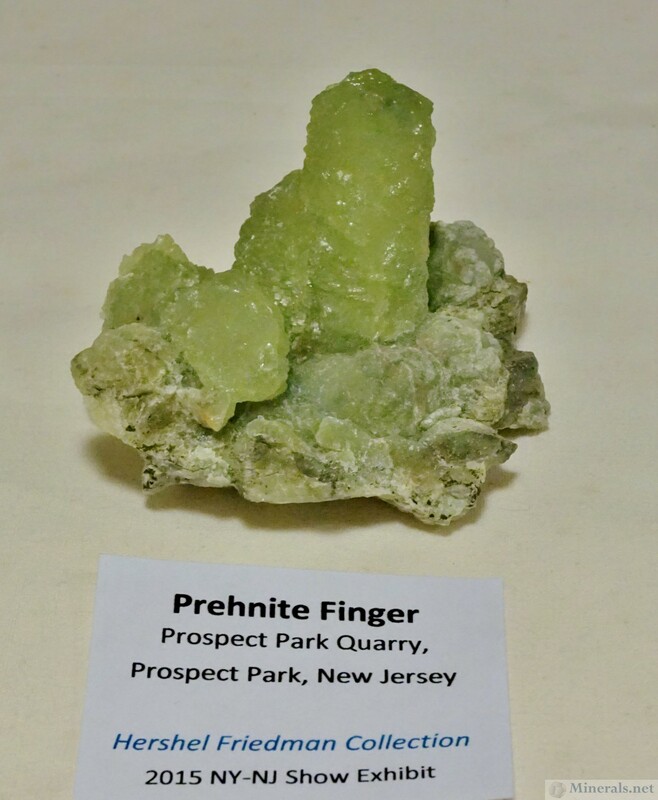 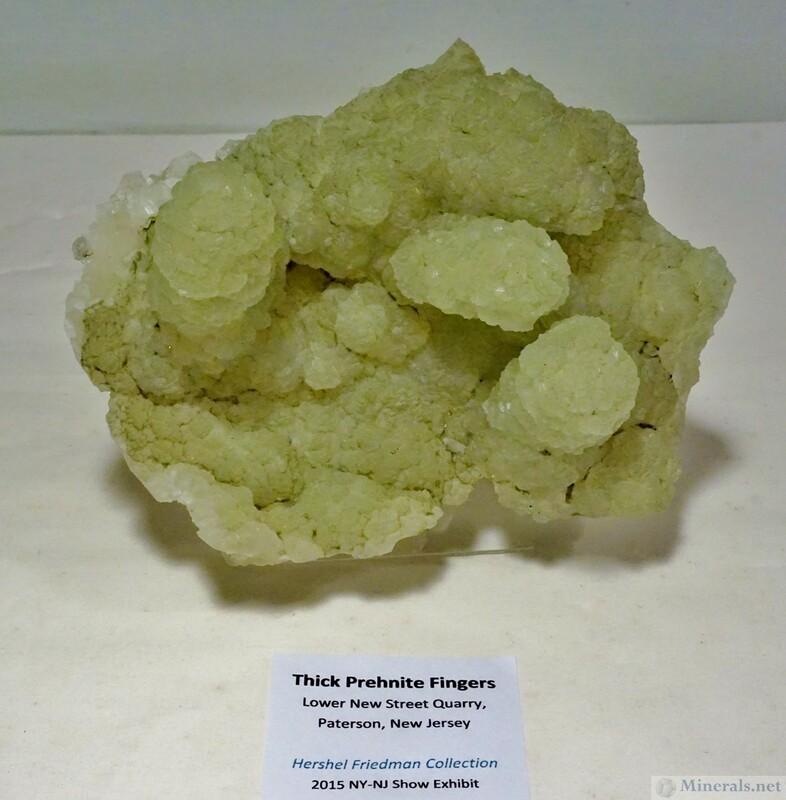 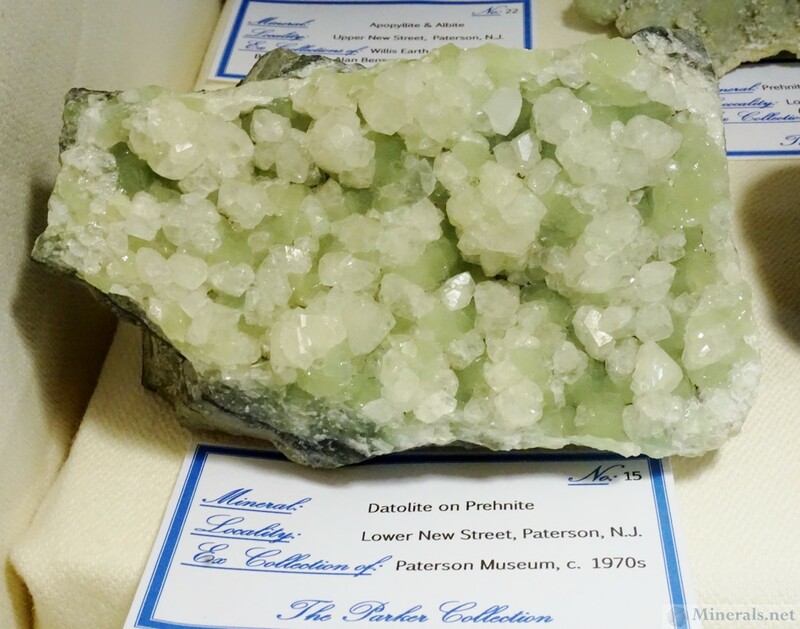 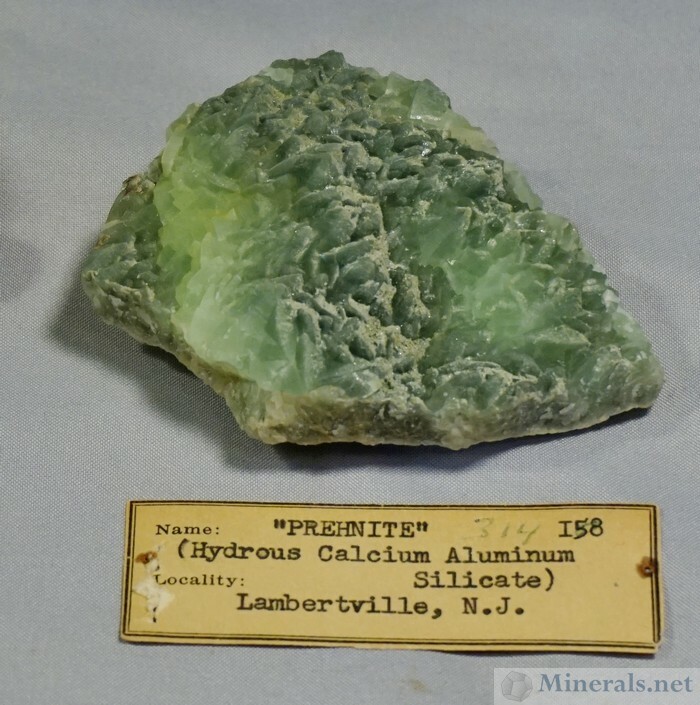 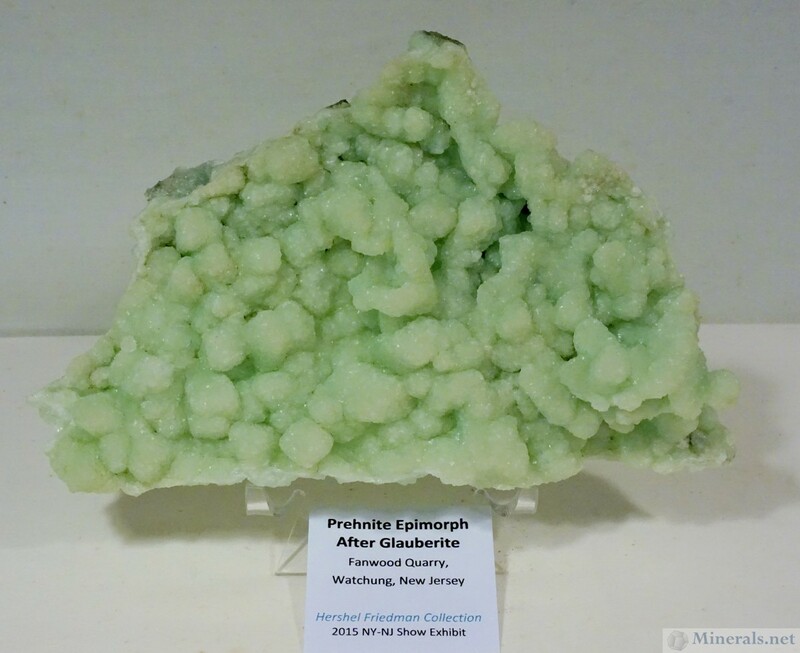 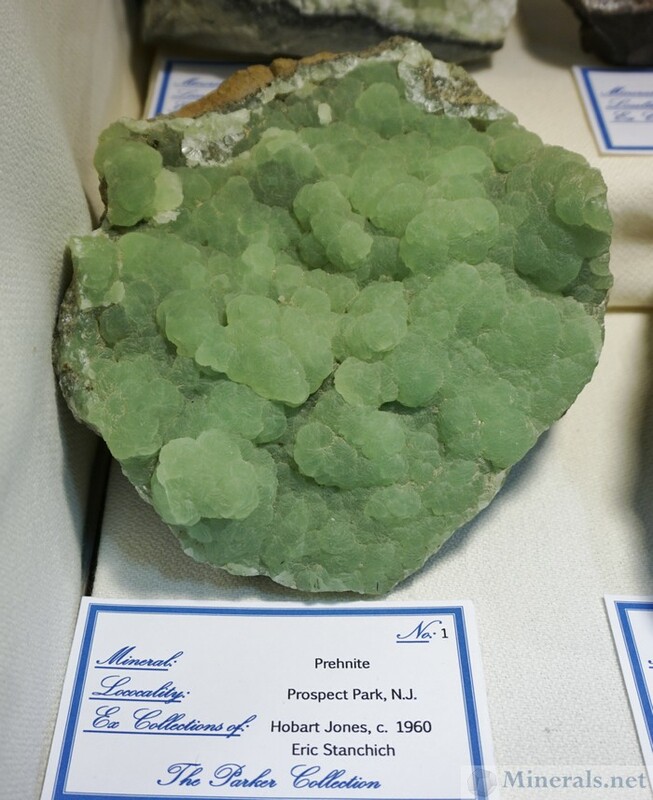 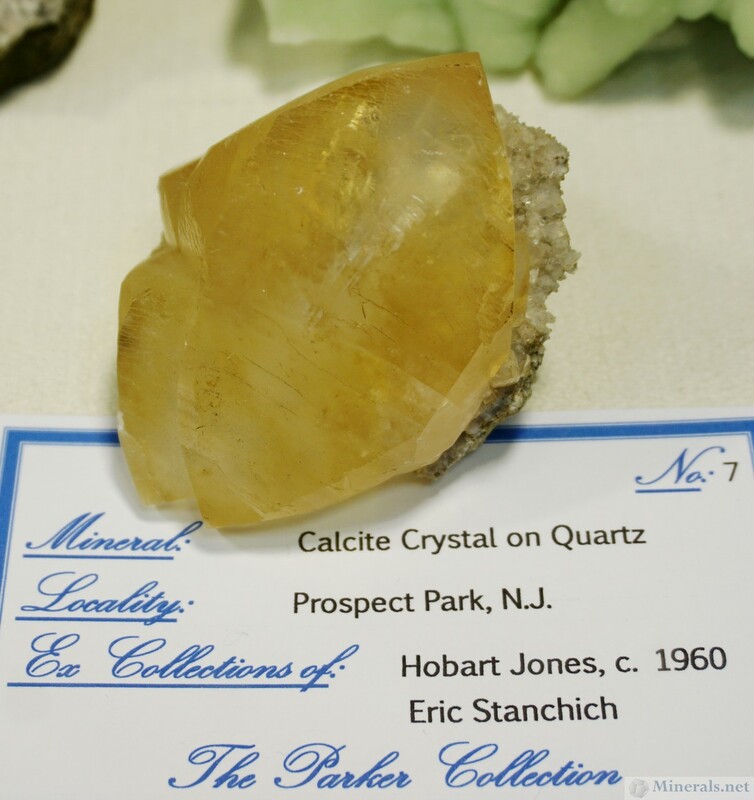 Hershel Friedman put together a public exhibit of Prehnite from the New Jersey traprock locations. 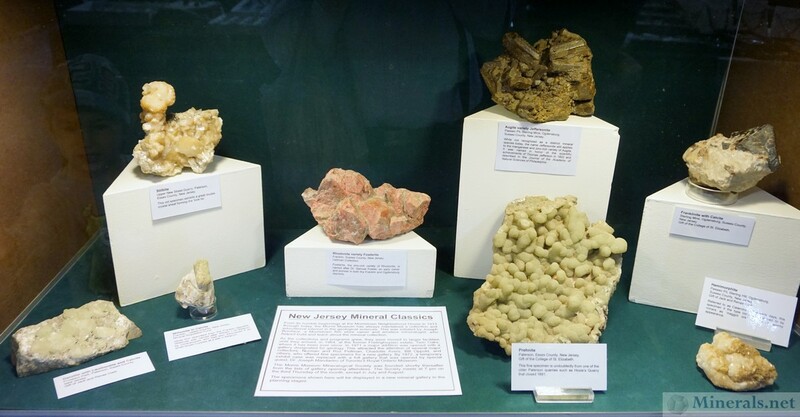 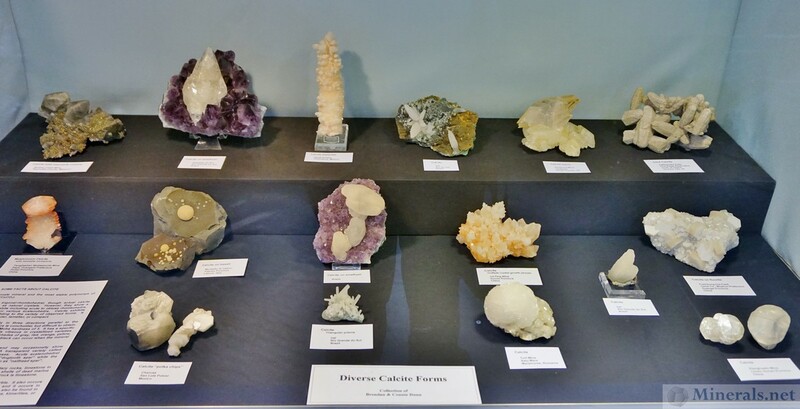 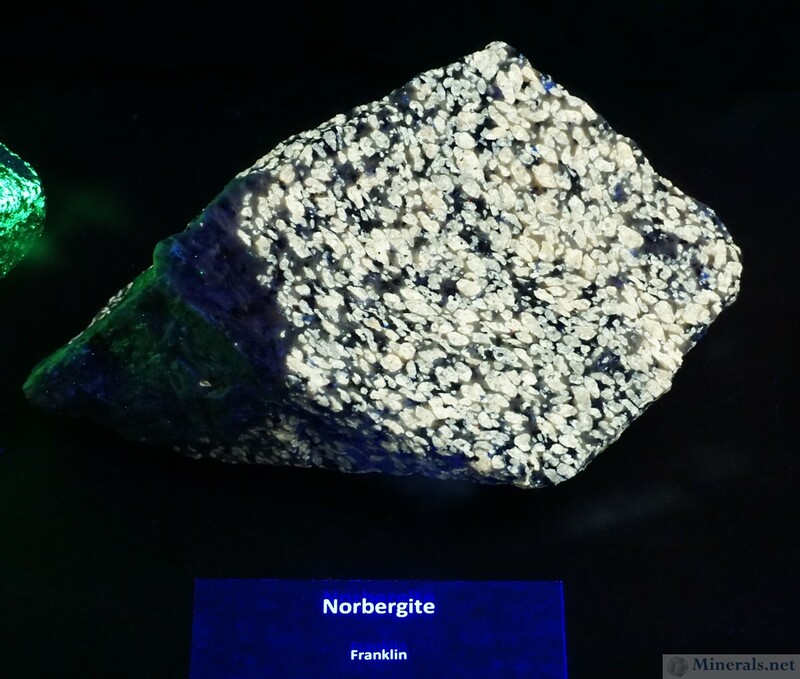 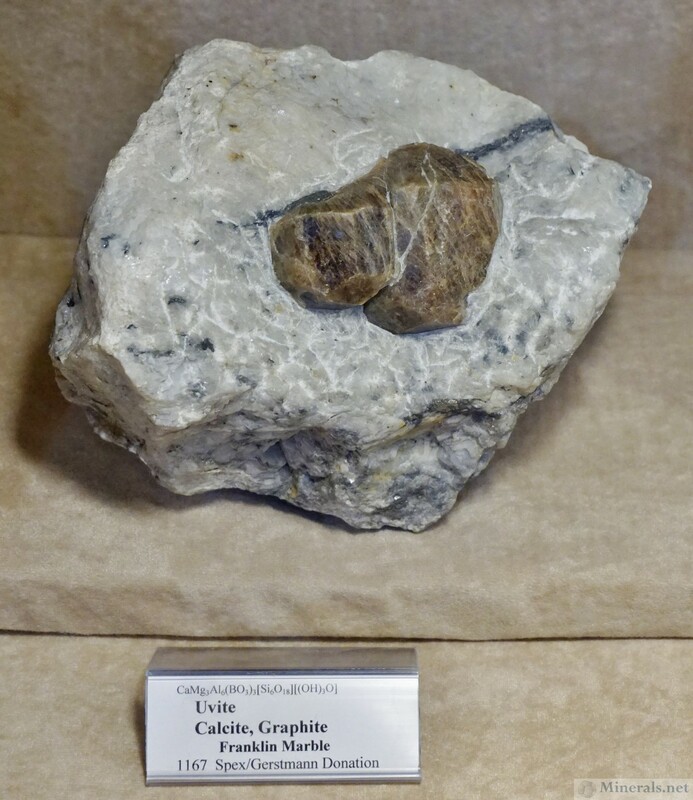 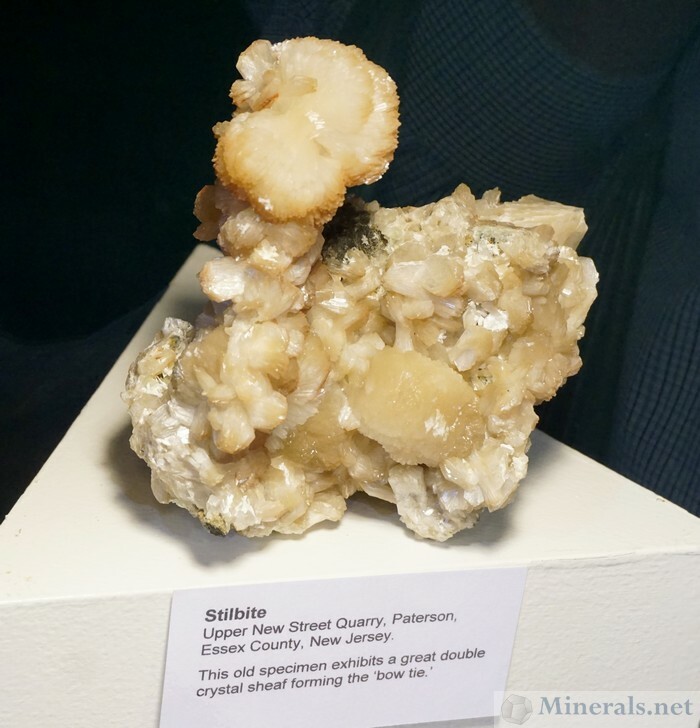 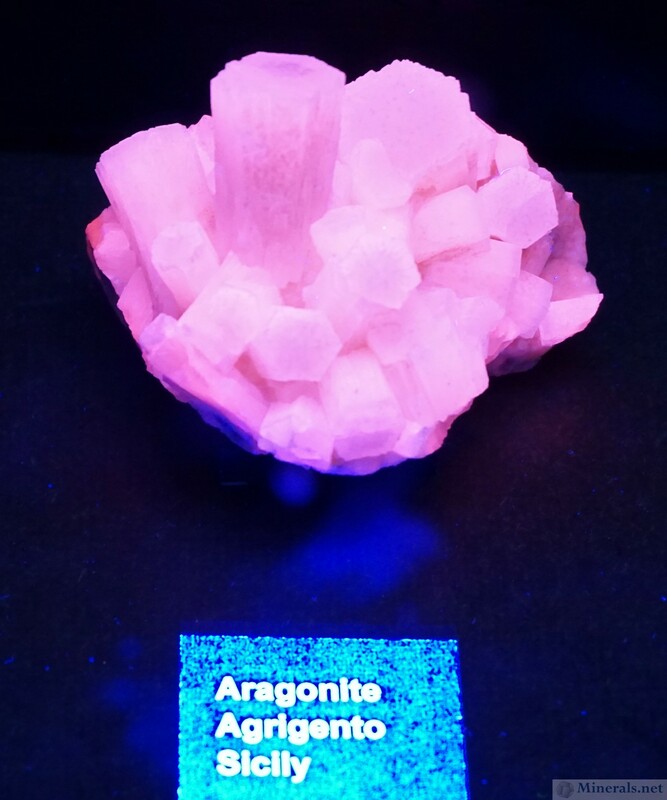 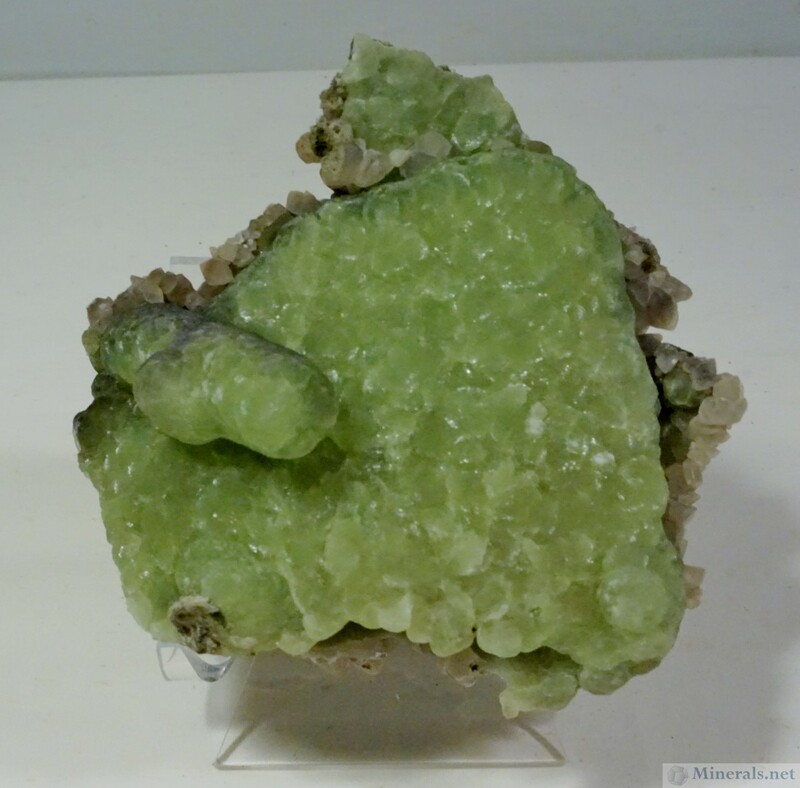 Below are photos taken of the individual minerals within that exhibit showcase. he The NY/NJ 2015 Gem & Mineral Show focused very much on making the lecture series a big success. 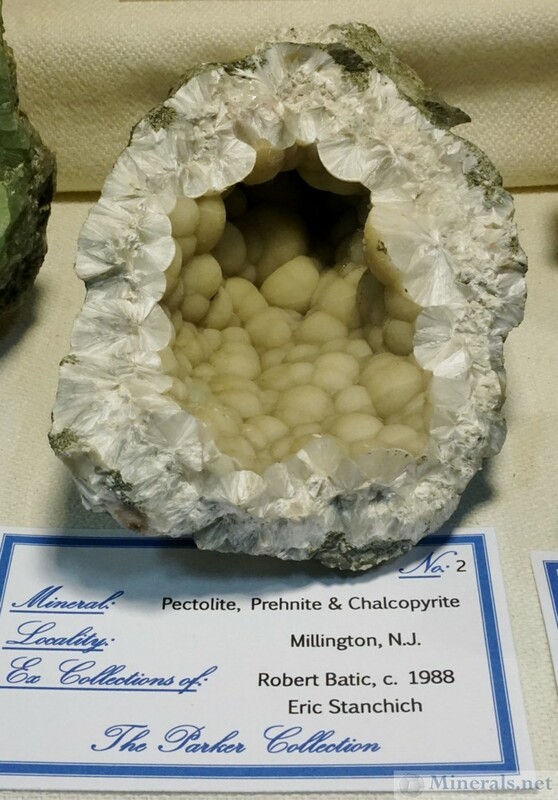 There was a great turnout and those who attended the lectures enjoyed them very much. However, the bulk of the focus was placed on the lecture series, and therefore the public exhibits were sidelined and not as impressive as in previous years. 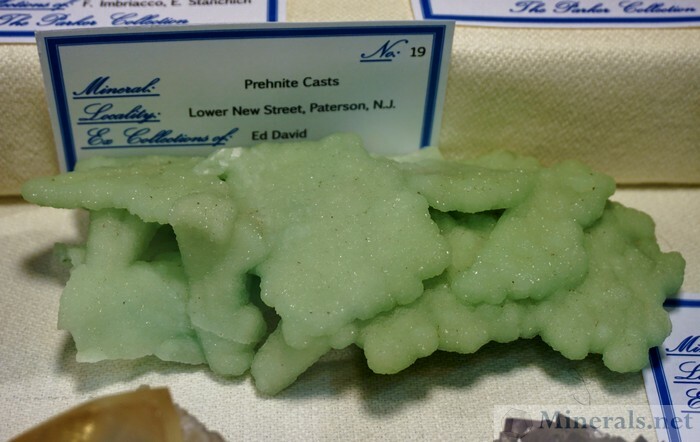 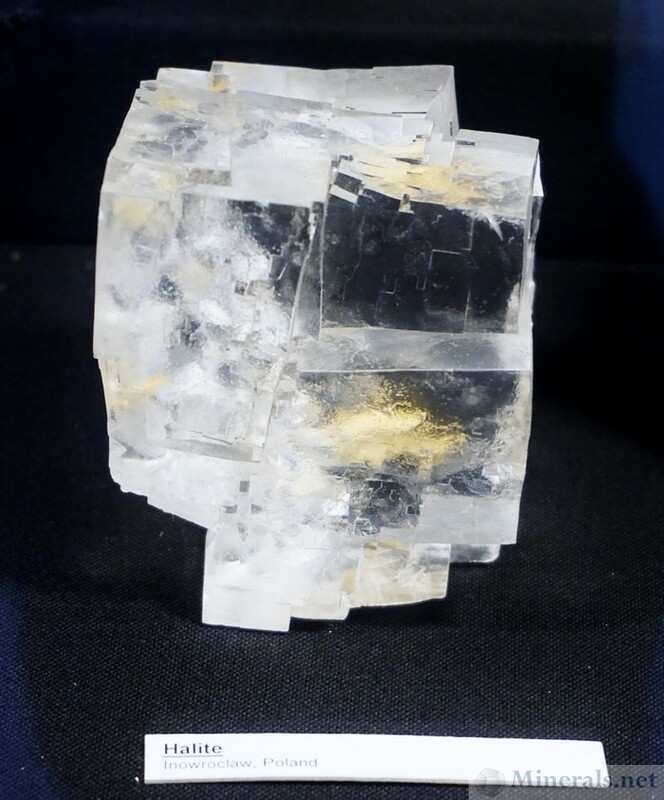 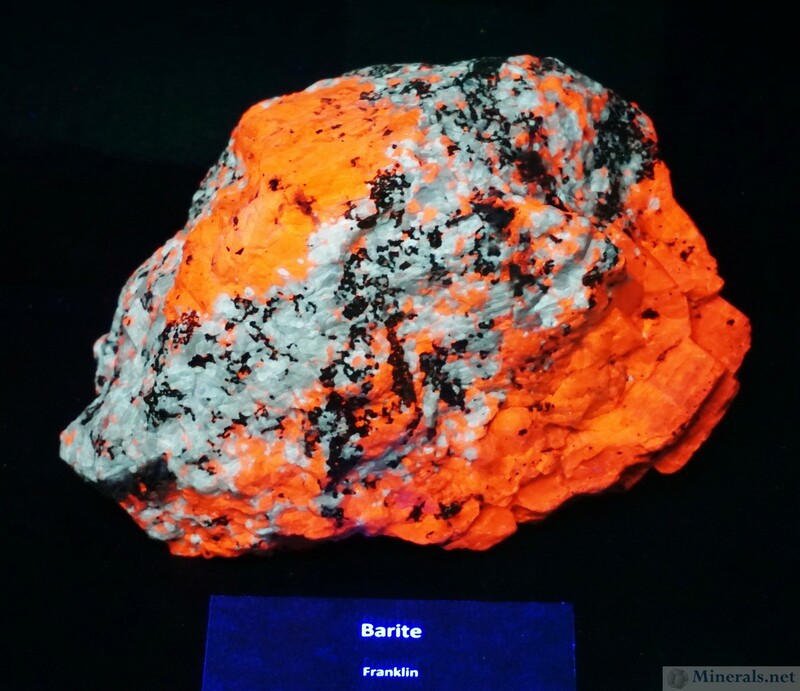 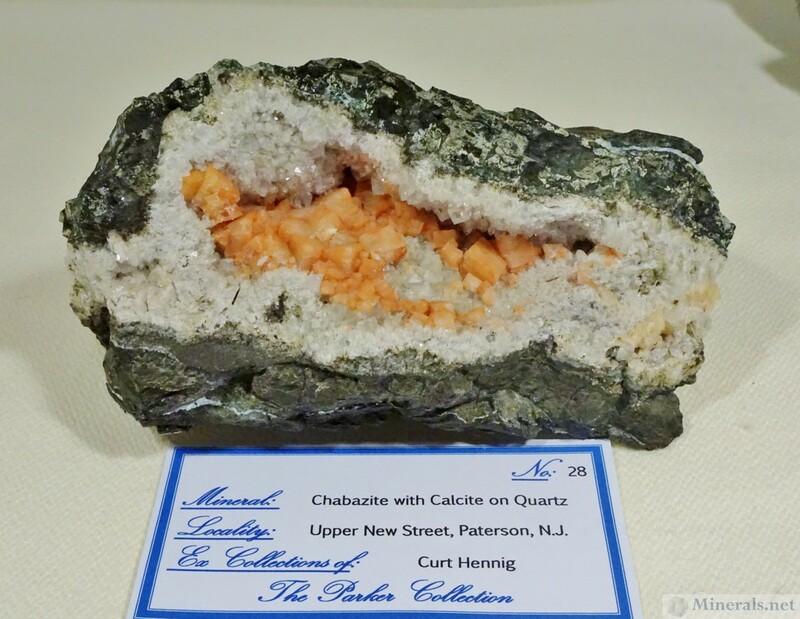 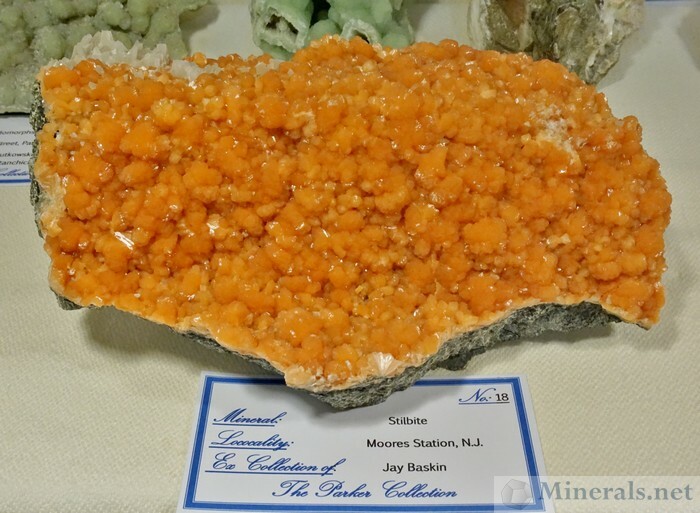 The NY/NJ 2015 Gem & Mineral Show has been putting together an outstanding showcase of fluorescent minerals the last couple of years, thanks to the contribution of the Franklin and Sterling Hill Museums and several collectors. 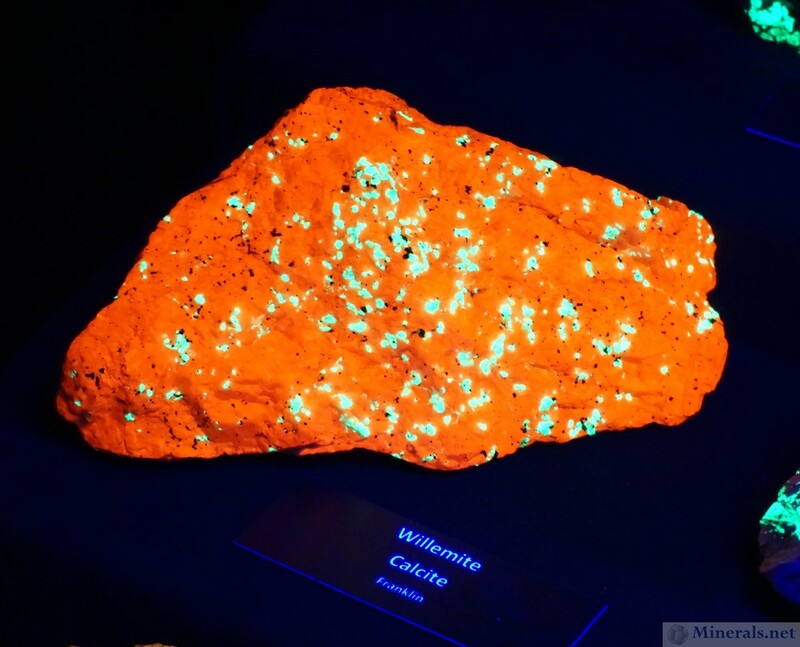 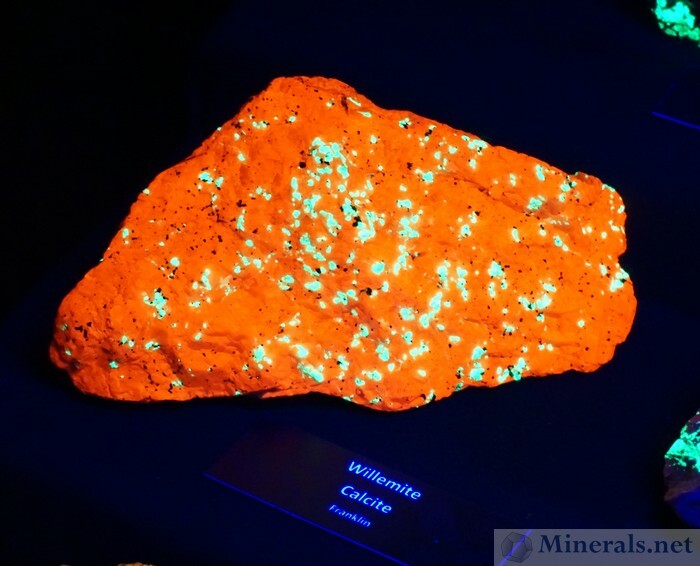 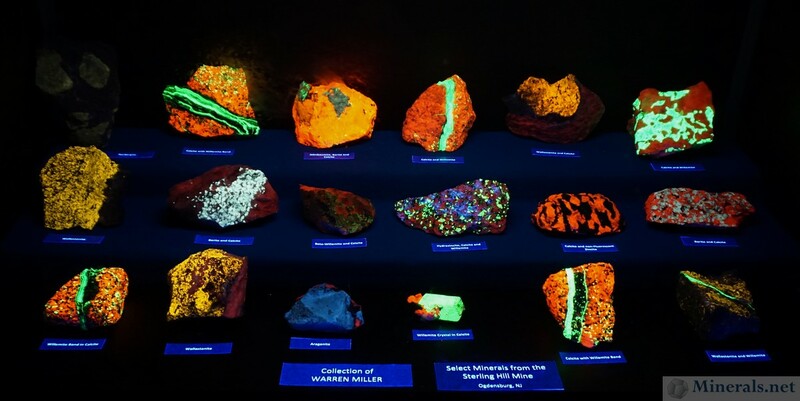 The fluorescent exhibits were quite impressive, filling a large room of brightly colored minerals glowing in ultraviolet light. 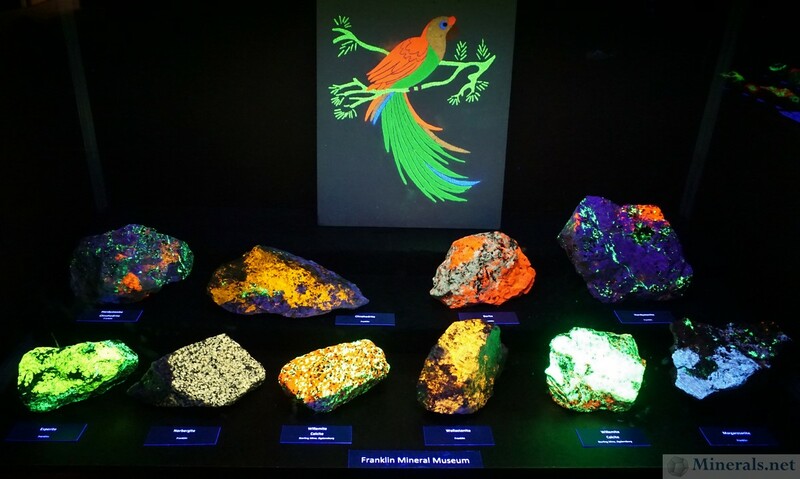 The room had large "fishtank"-style showcases with a a strong UV lamp on top illuminating the contents of brightly fluorescent minerals. 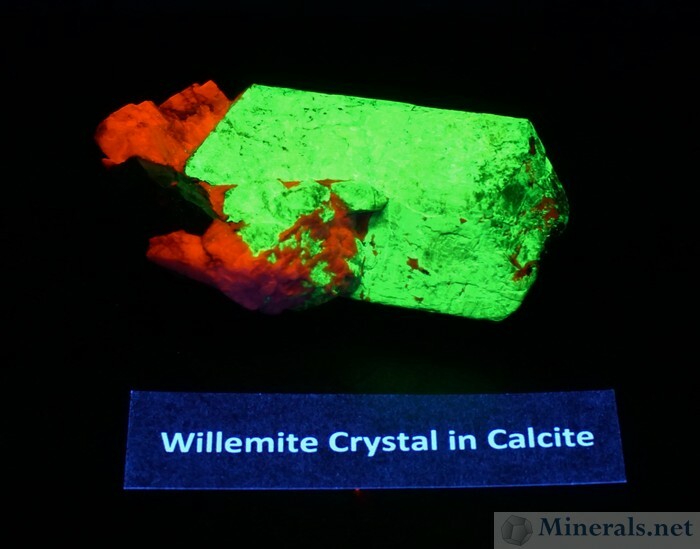 Most of the minerals were from Franklin and Sterling Hill, though there were some cases with a worldwide fluorescent assortment of both shortwave and longwave minerals.